Simple ground turkey recipes are becoming a favorite of mine. 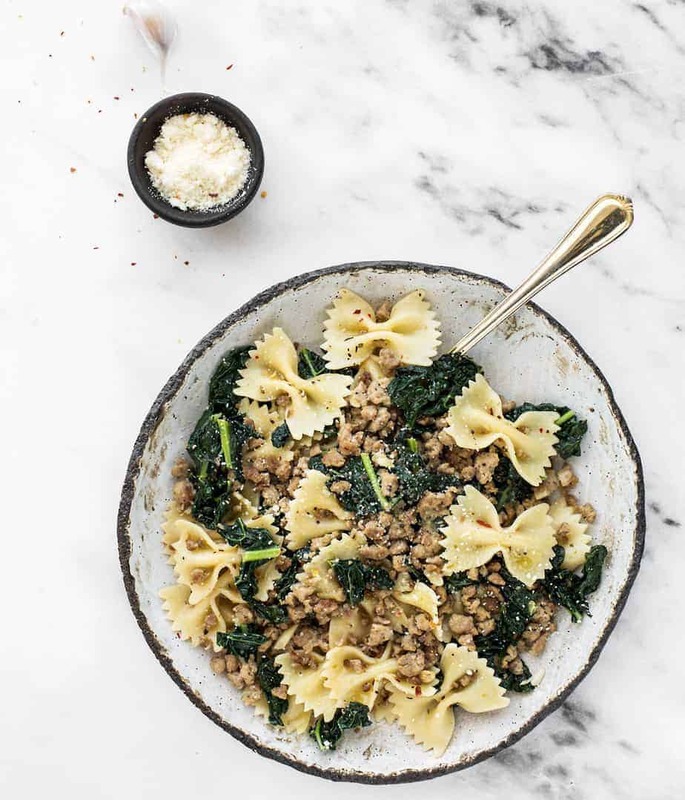 If you have pasta in your pantry, try this Lemony Spicy Italian Sausage Pasta with Kale. To add spiciness to this recipe, I added some dried red hot chili pepper. I used sweet Italian turkey sausage and sauteed the sausage until it was fully cooked and had a nice brown color. This pasta dish recipe would be perfect for any weeknight with just a little time after work. Pop the leftovers in the fridge or freezer and you’ll have a quick meal ready for lunch. 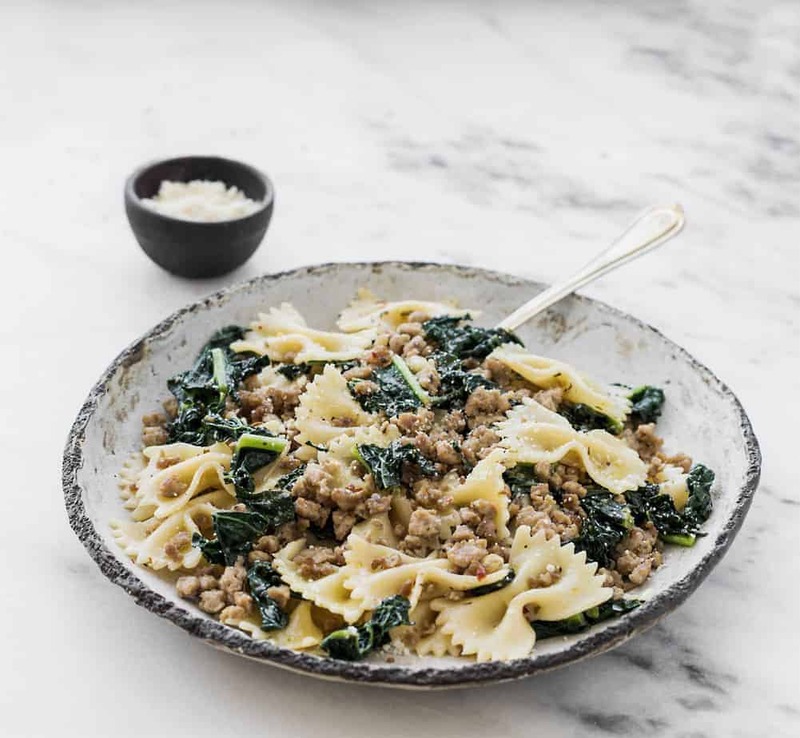 If you are looking for more pasta recipes, check out this creamy pasta sausage with kale recipe. Heat 2 tablespoons of olive oil in a skillet over moderate high heat then cook sausage, use a spoon to break any lumps and continue to cook until browed for about 7 minutes. Remove from the skillet and set aside. Blanch kale in a salted boiling water, uncovered for about 2 minutes. Remove kale from the heat and drain well. Cook pasta in a salted boiling water, uncovered until al dente. Remove from the heat, drain well and reserve 1/4 cup pasta cooking water for later use. Add 2 tablespoons olive oil in a skillet, stir in garlic, saute until it’s fragrant. Add red chili pepper, Italian Seasoning and cooked turkey sausage, then keep stirring. Cook for about 1 minute. Add kale, pasta and 1/4 cup reserved cooking water and lemon juice to skillet. Cook for about 2-3 minutes. Stir in cheese, remove from the heat and serve immediately. This seems like a pretty straight forward pasta dish to make after looking over your recipe. We enjoy using the kale but might substitute spinach sometimes. The sweet sausage give a great flavor and using the fun bow tie pasta makes the dish stand out. I love the addition of dried chili peppers since I enjoy a little kick of spice in my foods. This looks like something my husband would love also. You always share the most delicious looking food. My son would love this meal. He is such a huge fan of turkey sausage and kale. I love turkey sausage! This looks really good. I’m not sure about the Kale, honestly I’ve never had it! But it looks like a great meal to try ! This recipe looks so good. I love Italian sausage and pasta so it’s a win win for me! My husband really likes Italian sausage, and I love pasta. This meal would make both of us pretty happy! I make something similar to this, but without the kale. I will have to try adding it next time! It looks delicious! I am loving your pasta recipes! They all look so good and tasty. I will try to make this spicy Italian Sausage pasta too. This looks amazing. I love the bow-tie pasta, and the rest of it is making me hungry right now. It seems like definitely something I could do. I’m not sure how lemon and kale taste together, but it sounds like an okay recipe! I love bowties pasta and vineagrette together, so this must work! I keep seeing delish looking meals with kale and have yet to try it. I don’t know why I’m waiting! lol. Thanks for sharing! We’re big fans of sweet Italian sausage with pasta. I’m not sure if hubby likes kale or not, I don’t particularly so I don’t buy it. That looks so good. I just bought some Italian sausage and am on a hunt for a recipe. I am going to try yours, it looks and sounds amazing. Oooh, I love pasta with sausage inside.This recipe looks and sounds so delicious. I would love to try this recipe this weekend. It would be perfect for dinner! My friend is obsessed with kale. I’ve never seen her make or try something like this before though so I’ll have to share the recipe with her! That looks really good. I will have to try this really soon. I think we would all like it. Ohh this looks really good!! I love anything with sausage so I know this is delicious!